Both models are wet & dry so you can use them while in the shower or bath tab. Apply shaving cream a few minutes before shaving to soften hairs – making it easy to shave. Both models come with a facial cleansing brush and various attachments that turn the epilators into electric foil shavers. Both are 100% waterproof: You can easily clean them under running water. They use the latest Braun MicroGrip tweezer technology which features wider, longer and deeper tweezers that remove hair 4x shorter – performing better than waxing. Wider epilation heads on both models remove more hair in just a single pass. Virtually painless with regular use. Braun Silk-épil 9 9-961V comes with 2 body brushes exfoliate that can help you to reduce ingrown hairs. If you can’t afford Braun Silk-épil 9 9-961V or Braun Silk-épil 9 9-579 – opt for Emjoi AP-18 Emagine Dual Opposed 72 Tweezer Head Epilator. It is an affordable epilator with 72 tweezers tailored to offer you with a real close shave. You can use it on your legs or under the arms. You won’t feel pain when using this epilator – it does its job quickly & comfortably. The middle lifting fingers lift flat lying & short hairs for close cutting without irritating your skin. (1) Wet & Dry epilator – can be used with shaving cream / while in the shower to remove hair from legs & under arms, (2) Removes 4x shorter hair than regular waxing, (3) Comes with a Deep massage pad which helps in improving skin appearance,(4) You will also get 2 body exfoliating brushes which you can use to reduce ingrown hairs on legs & underarms, (5) It includes a shaver for bikini and other sensitive area, (6) 100% waterproof – this makes it easier to clean via running tap water, (7) 2 speed settings: Speed 1 is for extra gentle epilation, Speed 2 for an extra efficient epilation, (8) The Micro-grip Technology removes hair by the root thus offer you with long lasting smoothness. (9) Well made for a woman’s expectation – value for money. Best Affordable Epilator – Emjoi AP-18 Emagine Dual Opposed 72 Tweezer Head Epilator – Check price on Amazon – WHAT WE LIKE:- Can be used on most parts including bikini area, legs, arms and underarms. It works very well on slow speed – also make sure you don’t use too much pressure, Long cord 6 1/2 feet. Pulls out hair by the roots and if it fails, you go over that area again until you get a real clean shave – Emjoi does not cut hair under the skin, Less painful than most epilators on the market, 72 Tweezer Heads For Fast, Long-Lasting Results, Antimicrobial Protection (Emjoi will pamper your skin – keep it safe from infections using Silver Ion Technology). 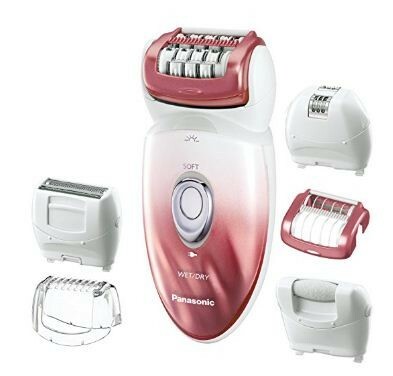 Panasonic ES-ED90-P Wet/Dry Epilator and Shaver – Check price on Amazon – Wet/Dry Epilator – can be used with shaving cream, Comes with 6 essential attachments and these include; (Pedicure Buffer for Foot Care, Pop-up trimmer for capturing stray hairs, Shaver head featuring hypo-allergenic blades & foil for safe hair removal on sensitive skins, Gentile Epilator Head, Epilator Gentile Cap, Bikini Comb and a Dual-Disc Epilator Head), Choose between 2 speed settings, Its Dual-Disc Epilation head features 48 Rotating tweezers tailored to offer your with a perfect close & clean shave, 100% Waterproof/Washable, Built-In LED Light makes it easy to see thinner – hard to see hairs. How to Prevent Ingrown Hairs After Epilating? We all know that epilation removes body hair right from its roots so that it takes long to grow back. However, the possibility of getting ingrown hairs after epilation is high – especially when you use a poor quality epilator. Briefly, let us see how you can prevent getting ingrown hairs after epilation. Clean your skin:- Before epilating your legs, arms or under-arms, have a thorough body shower with warm water and soap to soften hair follicles and the skin. It will be easier for the epilator to cut out hairs without nicking or irritating your skin. Warm water and a strong cleanser can help remove bacteria that might enter the skin during epilation. Exfoliate the skin:- Since you always use body lotions and at the same time sweat on a daily basis, dead cells can build up on your skin over time thus block hair follicles. Once these follicles are blocked, hair won’t be cut up-to its roots and this might result into ingrown hairs. So make sure you exfoliate the area to be epilated. Do it gently and take a shower after exfoliating – to clear up the skin and open up skin pores. You can use any of these natural exfoliation products like – Dry body brush, Sugar and olive oil paste and Baking soda and water paste. Clean & Sanitize your epilator:- Much as your epilator is new and well cleaned, I suggest you sanitize it to kill germs & bacteria that might find their way into your skin when epilating and thus cause ingrown hairs.You can use alcohol to sanitize your epilator. Follow instructions:- I’m sure each brand new epilator comes with instructions on how to use it. Read all instructions and follow them to minimize risks of getting ingrown hairs. On the other hand, those who use tweezers, they don’t come with instructions. So I advise you to opt for top of the range epilatiing machines like the ones I have featured on this list. Don’t pull your skin:- Avoid pulling your skin when epilating. Use as little pressure as possible. When you pull your skin, the tweezers can catch hairs underneath skin surface and this can increase chances of getting ingrown hairs. Wash your skin with warm water after epilation:- Doing this can kill germs, sooth your skin and at the same time keep your skin pores open. After that apply a moisturizer to ease any redness or inflammation. The Braun Silk-épil 9 9-961V Women’s Epilator an advanced electric hair-remover featuring a 40% wider-head in order to help women trim more hairs in just one-stroke compared to other epilators on the market. This epilator also features Braun’s revolutionary MicroGrip Tweezer-technology that removes hairs 4x shorter than wax can catch in order to provide women with beautiful, salon-smooth results that last for up to 4-weeks while the deep-massage pad helps to improve skin-appearance. On the other hand, this epilator comes with 2 body-brushes that help to exfoliate and reduce ingrown-hairs especially along the bikini-line and sensitive-areas. Additionally, this epilator features 2 speed-settings whereby Speed-1 facilitates for extra-gentle epilation while Speed-2 facilitates for an extra-efficient epilation. Lastly, it 100% waterproof design facilitates for quick and easy cleaning under running tap-water and it can be used to remove body-hair while in the shower. Pivoting-Head: The Braun Silk-épil 9 9-961V is equipped with a pivoting-head that adapts to every contour of the body while ensuring superior comfort and efficiency even in difficult-areas like the knee and underarms. Additionally, its head is 40% wider in-order to help remove more hairs in just 1-stroke. Pulsating Vibration: This epilator gives-off Active vibrations that provide an extra-gentle skin sensation during epilation in-order to reduce on discomfort especially when trimming hairs in sensitive-areas. MicroGrip Tweezer technology: This epilator features Braun’s revolutionary MicroGrip Tweezer-technology that removes hairs 4x shorter than wax can catch thus providing women with a beautiful and salon-smooth results that last up to 4-weeks. Deep Body Massage: This epilator features Braun’s new deep-massage pad that stimulates blood circulation in-order to help improve skin-appearance. Gentle Body Exfoliation-Brush: it also features a gentle exfoliation-brush that is ideal for treating more sensitive areas of the body. Deep Body Exfoliation-Brush: Braun’s deep-body exfoliation-brush head is designed to work 6X more effectively than a manual-scrub in-order to sweep away dead skin-cells and to help reduce on ingrown-hairs. Shave & Trim Cap: This epilator comes with a shaver-head and trimmer-cap that turn it into a fully functioning electric-shaver. Wet & Dry: The Braun Silk-épil 9 is a wet and dry epilator that can be used in the bath or shower. In fact, with regular use in water, epilation becomes virtually painless and more comfortable. Smart-light: The integrated smartlight helps to reveal even the finest body-hairs so as to facilitate for extra-thorough hair removal. A 40% wider-head removes more hairs in 1-stroke. Deep massage pad helps improve skin appearance. Body-brushes exfoliate and help to reduce ingrown-hairs. 100% waterproof for easily cleaning under running-water. Micro-grip Technology Efficiently removes hair by the root. A shaver head and trimmer cap turns the epilator into an electric-shaver. It a wet and dry epilator that can be used under wet or dry conditions. Epilator-head adapts to every contour for superior comfort and efficiency. A smartlight reveals the finest-hairs for thorough hair-removal. It is a bit expensive compared to other epilators on the market. The Braun Silk-épil 9 9-579 Women’s Epilator is an advanced hair-remover equipped with a 40% wider epilation-head that helps to remove more hairs in just 1-stroke compared to other epilators on the market. This epilator also features revolutionary MicroGrip Tweezer-Technology with wider, longer and deeper tweezers that increase epilation performance thus removing hair 4X shorter than waxing does while its pulsating active vibrations facilitate for an extra-gentle sensation and the pivoting-head smoothly adapts to body-contours in-order to facilitate for optimum comfort and efficiency. on the other hand, this epilator features an inbuilt Smartlight that reveals even the finest hairs in-order to ensure thorough hair-removal while its wet & dry operation enables you to use it in the shower for more comfortable epilation or to shave-dry when in a hurry. Lastly, the Braun Silk-épil 9 9-579 features a special facial-brush that helps to remove makeup and pore-deep impurities 6X better than manual-cleansing. A Wider Pivoting-head: The Braun Silk-épil 9 9-579 features a 40% wider epilation-head that ensures more hairs are captured and removed in just 1-stroke. This pivoting-head also smoothly adapts to body contours in-order to facilitate for superior comfort and efficiency. MicroGrip Tweezer Technology: it also features revolutionary MicroGrip Tweezer Technology that uses wider, longer and deeper tweezers to increase on epilation-performance thus removing hairs 4X shorter than wax does. Wet and Dry Operation: This epilator can be used in the shower to achieve a more comfortable epilation or it can be used under dry-conditions when you’re in a hurry. Pulsating vibration Technology: The Braun Silk-épil 9 9-579 also uses pulsating active vibrations in-order to provide you with an extra-gentle sensation when epilating your body. Braun facial-brush: it also comes with a special Braun-facial-brush that helps to remove makeup and pore-deep impurities 6X better than manual-cleansing. Additionally, this helps to refine and exfoliate the skin with its micro-oscillations. SmartLight: The Braun Silk-épil 9 9-579 Women’s Epilator features an inbuilt Smartlight that helps to reveal the finest body-hairs in-order to help women achieve an extra-thorough hair-removing process. An in-built Battery: This epilator features a built-in lithium-ion battery that is designed to provide 40-minutes of cordless-usage after a 1-hour charge. A 40%-wider epilation head that removes more hair in 1-stroke. Wider, longer & deeper tweezers remove hairs 4X shorter than wax does. Wet and Dry operation for convenient usage. An extra-gentle epilating sensation due to pulsating-vibrations. A pivoting-head that smoothly adapts to all body-contours. A Smartlight that reveals even the finest-hair when epilating. A facial-brush that removes makeup and pore-deep impurities. It refines and exfoliates the skin with micro-oscillations. It comes with 7 extra-attachments for carrying-out different functions. It’s not provided with a sonic exfoliation-brush but the facial-brush can do the exfoliating. It is a bit expensive compared to most epilators on the market today. The Emjoi AP-18 Emagine is ladies, dual-opposed epilator equipped with 72 Tweezer-heads that help to remove hair quickly and comfortably when epilating. This epilator features patented Glide-Technology that lifts up hair for quick and easy removal. The Emjoi AP-18 Emagine is also the first epilator in the world to offer Silver-Ion Technology that provides antimicrobial protection from bacterial-infections while the Dual Opposed Staggered Heads allow the epilator to cover more surface-area, grasp and even remove more hairs in just one-pass. On the other hand, this epilator also features middle-lifting-fingers that prepare hair for removal by lifting flat and short hair and then remove it from the roots while decreasing on the possibility of ingrown hair. In fact, this epilator will leave your skin smooth and clean for up to 6-weeks. lastly, it features a curved-shape designed to hug all the curves of your body while its ergonomic handle that feel well-balanced within your hands facilitates for easy holding and maneuvering all-over the body. 72 Tweezer Heads: The Emagine Emjoi AP-18 features 72 Tweezer-heads that help to remove body-hair in just one-pass. In fact, these operate in such a way that the one fixed Tweezer-disc works together with two that open and close while capturing every last hair and the 17-millimeter disk opening creates the optimal radius to effectively remove any lingering hair-strands. Glide Technology: The Emjoi’s patented Glide-Technology lifts up body-hair and enables the tweezers to skate over the skin thus helping to minimize skin-irritation. In fact, with this technology you will enjoy long-lasting results for up to 6-weeks. Silver-Ion Technology: the Emagine Emjoi AP-18 is also the first epilator in the world to offer Silver-Ion-Technology that provides antimicrobial protection in-order to ensure a safe and healthy hair-removal experience. This technology was actually designed to pamper your skin and keep it safe from any infections. 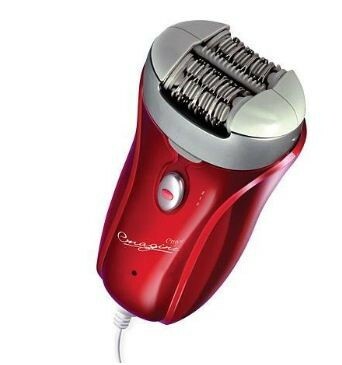 Dual-Opposed Staggered-Heads: This epilator is equipped with dual opposed staggered heads that allow it to cover more surface-area while grasping and removing the body-hair. Lifting-Fingers: In-order to reduce on the chance of ingrown-hairs, the Emagine-epilator uses exclusive lifting-fingers that lift flat and short body-hairs for easy and even epilation. In fact, this epilator can remove body-hairs from the root as short as 0.5 millimeters which other hair-removal-systems often can’t. Ergonomic-Handle: The Emjoi AP-18 features an ergonomically engineered handle that balances in your hand and it’s very easy to maneuver all over your body. This handle even features a Soft-touch grip for optimum comfort and control. Dual-Speed Control: The Emjoi AP-18 also features a Dual speed control that lets you customize your epilating-experience. 72 Tweezer-heads remove hair quickly and comfortably. Glide-Technology that lifts up hair for quick and easy removal. Silver-Ion Technology provides antimicrobial protection. It leaves the skin smooth and clean for up to 6-weeks. Curved-shape designed hugs all the curves of your body. Ergonomic handle facilitates for easy holding and maneuvering. A Dual speed-control lets you customize your epilating-experience. It lacks an inbuilt battery and this implies that it can be only used when connected to a power-supply through its power-cord. The Braun Silk-épil 5 Power-5280 is a ladies epilator equipped with 40 Close-Grip tweezers that help to remove even the shortest body-hairs leaving your skin smooth for up to 4-weeks. This epilator also features a high-frequency massage system that stimulates the skin in-order to facilitate for more comfortable epilation while its pivoting-head follows every contour of your body for better skin-contact and gentler performance. On the other hand, there is an integrated smartlight into this epilator that helps to reveal even the finest hairs in-order to facilitate for thorough hair-removal while the speed personalization allows you to select the right speed in-order to meet your individual needs. Lastly, this epilator comes with a shaver-head and trimmer-cap that turns it into a full-performance electric shaver while the included cooling-glove helps to cool and prepare your skin before epilation and then soothes it after epilating. Silk-épil CloseGrip Tweezer Technology: the Braun Silk-épil 5 Power 5280 epilator features 40 Close-Grip tweezers that help to remove even the shortest-hair leaving your skin smooth for up to 4-weeks. In fact, Braun’s specially designed Close-Grip 40-Tweezer Technology catches hair as small as a grain of sand. High-frequency massage system: The integrated high frequency massage-system helps to stimulate the skin for more comfortable epilation thus eliminating any skin-irritations. Pivoting-Head: The epilator’s pivoting-head is designed to follow every contour of your body in-order to facilitate for better skin-contact and gentler performance. In fact, with this pivoting-head you will be capable of achieving the best epilating experience. SmartLight: The integrated SmartLight helps to reveal even the finest body-hairs so as to facilitate for extra-thorough hair removal especially when epilating in low-light areas. Shaver-Head: This epilator also comes with a shaver-head and trimmer-cap that turn it into a full-performance electric-shaver. This means that you will even be capable of trimming hair in different body-section more comfortably under the shaver-mode. Speed-Personalization: the integrated speed-personalization settings will allow you to select the right speed for your individual epilating-needs. So, you will be able to select either a high or low speed-setting depending on the time you have for epilating. It removes the shortest-hairs leaving the skin smooth for up to 4-weeks. It stimulates the skin for more comfortable epilation. Pivoting-head follows every contour of your body for optimum skin-contact. A Smartlight reveals even the finest-hairs when epilating. Speed-Personalization allows you to select the right epilating-speed. It can be turned into a full-performance electric-shaver. Cooling-glove cools and prepares the skin for epilation & soothes it afterwards. It does not have inbuilt-battery and can only be used corded or connected to a power-supply. It lacks a sonic exfoliation-brush that can be used for exfoliating-purposes. The Panasonic ES-ED90-P is a women’s Wet/Dry Epilator and Shaver equipped with a high-performance dual-speed motor and 6 snap-on hair-remover and pedicure buffer-attachments in-order to provide you with a complete hair-removal and foot-care experience while at home. In fact, the included shaver-head features hypo-allergenic blades and foils that facilitate for safe hair-removal on sensitive-skins while the integrated pop-trimmer captures long and stray hairs and even trims, shapes and maintains the bikini-area. On the other hand, the Panasonic ES-ED90-P features a wide, dual-disc Epilation-Head that conforms to individual body contours making it ideal for hair-removal on legs and arms while the included Gentle-Epilator Head helps to remove hair from sensitive areas. Additionally, its a Wet and dry epilator/shaver and this implies that it can be used dry anytime or in bath/shower using your favorite gel/foam. Lastly, this Panasonic shaver/epilator cleans quickly and easily under warm running water even includes a Built-in LED-Light and travel-pouch. Dual-Disc Epilation Head: this epilator comes with a large contoured epilation-head attachment with dual-wide discs and 48 precision rotating tweezers that help to firmly capture, hold and extract hair cleanly at the root for optimum hair-removal and comfort. In fact, this makes the epilator an excellent alternative time-consuming and costly waxing. Smooth-Pivot Epilator Head: it also features a large epilation-head that pivots 30° forward and 30° backwards so as to0 gently conform to all the body-contours for an ultimately smoother and cleaner epilation process with more desirable results. Dual-Speed Modes: The Panasonic ES-ED90-P epilator features 2 separate speed-settings that make it very easy to control the epilating-speed in-order to meet your personal-comfort needs during the hair-removal process. A shaver-head: The included shaver-head features ultra-sharp, hypoallergenic, durable blades and protective foil-cover specially designed to protect your sensitive-skin while shaving. Additionally, this shaver-head features a large surface-area that makes it ideal for leg-shaving. Pop-up Trimmer: The shaver-head includes a pop-up trimmer that quickly removes unwanted-hairs in areas like along the bikini-line. On top of that, this bikini-trimmer can also be used for detailing purposes in some areas if you wish to do so. Bikini comb-attachment: The included bikini-comb attachment comfortably trims hairs in sensitive-areas like along the bikini-line. In fact, this makes the Panasonic ES-ED90-P epilator an excellent alternative to waxing. Gentile Epilation-head: The included Gentle Epilation head is idea thoroughly trimming hairs in sensitive-areas like in the bikini-region while ensuring optimum comfort with minimized skin-irritations. Pedicure-Buffer Attachment: The included pedicure-buffer facilitates for great foot-care while the heel-buffer gently removes callousness and dry-skin from the heel-area. 100% Waterproof: The Panasonic ES-ED90-P shaver and epilator is 100% waterproof and can be easily used under wet-conditions using your favorite shaving gel/foam. However, it can also be used comfortably under dry-conditions for quick and gentle hair-removal especially when in a hurry. Lastly, this epilator can be easily cleaned under running tap-water in-order to keep it in top-notch condition. LED-Light: This epilator features a built-in LED-Light that makes hair-removal more efficient by clearly illuminating lighter and thinner hard-to-see body-hairs for quicker and easier epilation or shaving. A Travel-Pouch: The included travel pouch helps to neatly hold your Panasonic Epilator and Shaver, other-attachments and the included AC-charger. This implies that you will be able to travel with your epilator-package so that you can easily remove unwanted body-hairs wherever you are. 6-attachments to maximize personal-care convenience. A flexible & large epilation-head captures holds and extracts hair at the root. 2 separate speed-settings make it very easy to control the epilator. A Gentile Epilation-head for hair-removal in sensitive areas. A foot-care & heel-buffer gently remove callousness and dry-skin from the feet. Travel-pouch neatly holds the Epilator & other attachments. 100% Waterproof for trimming under wet-conditions & easy cleaning. Built-In LED Light that clearly illuminates hard-to-see hairs. Its battery run-time is slightly shorter compared to other advanced epilators in its range.